In the past, to ensure your mix sounds right on any device, you had to export your sound and listen in different conditions. Import your mix to your smartphone, burn on CD and listen in your car, get back to your studio, do little tweaks and export again. Simulation offers acoustic models of several consumer devices and classic reference monitors. Compensation section for 5" or 8" speakers or headphones. 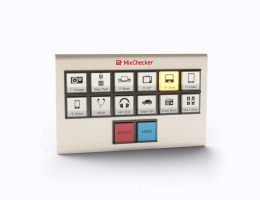 MixChecker version 1.1 brings independent volume setting for each simulated device. Simplified controls grant more efficiency and speed to the workflow. Improved compatibility with recent DAWs and OS. Added Mono button, desired by many users.